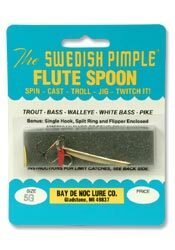 These spoons have build in retrieve and trolling action to fill the demand for a lighter “Swedish Pimple.” For casting, trolling or jigging with the same results as our original Swedish Pimples. The Flute Spoon lure has a wiggling and wobbling action on retrieve or trolling and yet retains the falling back action of our jig. A deadly still fishing jig when baited with minnows or perch eyes for walleye, perch, crappies, bass, trout and northern. It is available in highly polished or plated finished of solid nickel, gold (buffed brass) or white pearl colors. It is specially coated to retain a high luster and prevent tarnishing. A bonus flipper, single hook and front split ring is included. #3 1 1/7 oz – 1 ½ in. #4 1 1/7 oz, – 1 ¾ in. #5 1 1/6 oz. – 1 in. #6 1 1/3 oz. – 2 ¼ in.